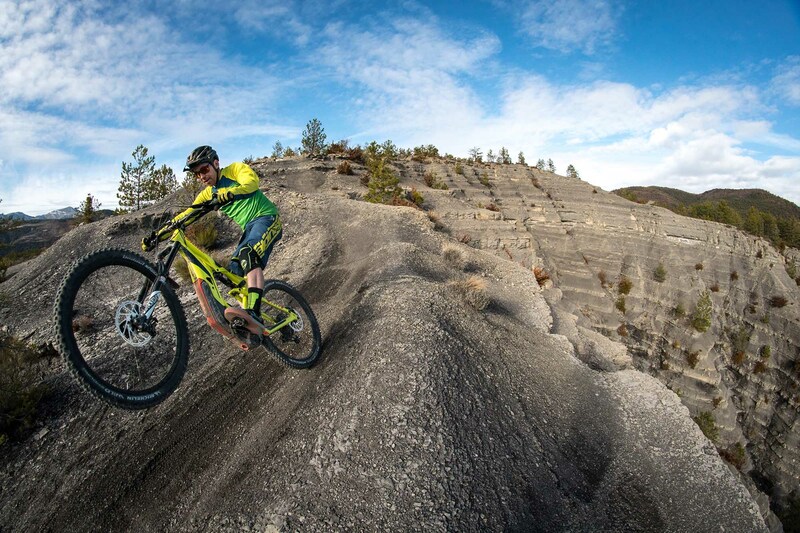 As the front man of Cannondale’s pro rider line-up, and without having to focus on trying to win EWS races, Jerome now gets to take his pick of which ever bikes he wants to ride and where. The one bike that he’s been reaching for a lot recently? Interestingly, it’s Cannondale’s Monterra e-Bike. We recently caught up with JC for a chat about e-Bikes and how he likes to set-up his personal bike. Good to catch up with you again mate. Tell us a bit about how you find riding e-Bikes? So much fun! To be honest in the downhill sections I don’t make much difference in my tail choice as if I were on a normal bike, I’m still able to pin everything. But the trails I ride uphill, wow, I can pick trails that I never could dream of before. That makes a ride fun the whole way. We’re starting to see more and more pro MTB racers riding e-Bikes during their time off. I guess everyone just loves having fun, right? Yes, for sure. When I am at home I ride a lot of different types of bikes. One day my e-Bike, next day my dirt jump bike, then my Enduro bike. It depends what you or your friends plan to do. e-Bikes are also great from a training perspective as I can still go riding on a rest day when it’s sunny outside, so instead of doing nothing I go for some easy ride in Turbo mode! What is the longest ride you’ve done so far on an e-Bike? When you’re out riding this bike do you change between the different power modes or do you just keep it in the max turbo setting the whole time? I’m riding most of the time on the e-MTB mode which is really adapted for the MTB. When you push harder on the pedal it gives you a bit more assistance and when you just spin it doesn’t drain the battery. But if I need to go longer I’ll select Tour mode, but only occasionally will I use Turbo. By the looks of these photos and the web video’s that we’ve seen of you riding your e-Bike you certainly don’t seem to hold back. You’re hitting big jumps and gaps, etc. Does this bike give you lots of confidence to ride bike lines? It takes a little bit of time to adapt to the weight, especially under braking and quick transition left-right as there are more forces. But on the other hand, the bike sticks to the ground, the grip is amazing and once in the air it’s way more stable. Jumping isn’t a problem and it’s impressive the speed you can carry. We’ve heard a few rumours that the EWS is looking to add e-Bike racing into their series. What’s your thoughts on that? I don’t think that will be for me. I like e-Bike for my pleasure but I don’t think it’s made for racing. Let’s talk about your set-up. The Moterra features the powerful BOSCH Performance CX 250W motor, how do you find the ride and feel of that unit? I’ve tried different motors and for me Bosch has a good balance with raw power, control and torque. The 4 modes allow you to have the assistance you need. It’s punchy and it feels the best around 90 Rpm which is a cadency I like. I found the limit where you are above 25km/h as you need to drag the engine without assistance but you get a better torque most of the time. Your bike also features a Bosch PowerPack 500Wh battery. What would you say is the average maximum trail time that you’re able to get out of a full charge? In e-Bike you don’t really compare with time but more into elevation, as if you ride on the flat you can almost ride forever. I’ll say I can get 1700m elevation with Eco,1500m on tour, 1300m with E-mtb mode and 1000 with Turbo. Enough for a good 2 hour intensive ride. The Moterra LT model packs 160mm of travel front and rear, is that more than enough to eat up those bigger hits? I like the Geo of the Moterra LT, it’s a good Enduro bike with the shortest chainstay on the e-Bike market. This makes it easy to handle and also very playful. For the travel, it doesn’t matter if your bike weigh 23kg or 24kg so why would you save few grams and perhaps sacrifice having the extra fun. I’m really happy with my current set-up. Cheers for the chat mate. Thank you – hopefully I’ll come visit Australia again soon! Previous ArticleBehind the scenes of Connor Fearon’s section in Gamble!